The Strata 11-Piece Women's Set is designed for maximum performance right out of the box. 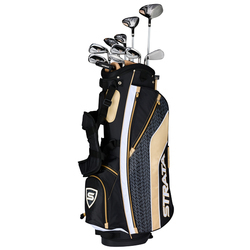 Set includes: Driver, 5 Wood, 5 Hybrid, 7 & 9 Iron, SW, Putter, Stand bag, and 3 Headcovers. The Strata 11-Piece Women’s Set is designed to give you maximum performance right out of the box for more confidence from tee-to-green. The lightweight 460cc forged driver, fairway wood, hybrid, irons and putter make up a set that’s specifically designed to give women a great combination of distance, forgiveness and control with clubs that are very easy to hit. Driver: A lightweight 460cc forged driver that has a large sweet spot, a titanium head, and provides more forgiveness to help you hit it farther off the tee. (Headcover included) Fairway Wood: This oversized fairway wood is very forgiving and has a more aerodynamic head shape for long, high flying shots. (Headcover included) Hybrid: A great alternative to difficult long irons that gives you more confidence on a variety of shots. (Headcover included) Irons/Wedges: These stainless steel irons offer a great combination of forgiveness and control. Putter: A mallet putter with alignment to help give you incredible accuracy. Stand Bag: A lightweight and durable stand bag that comes with five convenient pockets, an additional cooler pocket, a rain hood and a backpack strap system. 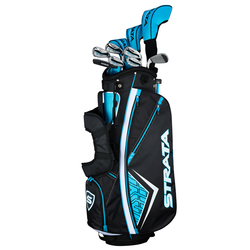 The Strata 12-Piece Set is designed for maximum performance right out of the box. Set includes: Driver, 3 Wood, 5 Hybrid, 6 - 9 Iron, PW, Putter, Stand Bag, and 2 Headcovers. The Strata Set is designed to give you maximum performance right out of the box for more confidence from tee-to-green. The lightweight 460cc forged driver, fairway wood, hybrid, irons and putter make up a set that provides a great combination of distance, forgiveness and control, and is very easy to hit. Driver: A lightweight 460cc forged driver that has a large sweet spot, a titanium head, and provides more forgiveness to help you hit it farther off the tee. (Headcover included) Fairway Wood: This oversized fairway wood is very forgiving and has a more aerodynamic head shape for long, high flying shots. (Headcover included) Hybrid: A great alternative to difficult long irons that gives you more confidence on a variety of shots. Irons: 6-PW These stainless steel irons offer a great combination of forgiveness and control. Putter: A mallet putter with alignment to help give you incredible accuracy. Stand Bag: A lightweight and durable stand bag that comes with five convenient pockets, an additional cooler pocket, a rain hood and a backpack strap system. 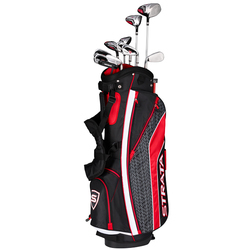 The Strata Plus Set is a full set with a great combination of distance and forgiveness right out of the box. Set includes: Driver, 3 Wood, 5 Hybrid, 6-9 Iron, PW & SW, Putter, Stand Bag, and 3 Headcovers. The Strata Plus Package Set is designed with distance and forgiveness technologies to help you easily hit accurate shots that go a long way. Now you have full course coverage from tee-to-green, giving you the confidence to hit good shots with every club in the bag. Driver: 460cc clubhead with a larger sweet spot and graphite shaft for more distance off the tee. (Headcover included) Fairway Wood: Stainless steel clubhead and graphite composite shaft promote faster swing speeds and long shots. (Headcover included) Hybrid: Designed for versatility and forgiveness on shots where you would usually hit a difficult long iron. (Headcover included) Irons: 6-SW Perimeter weighting and progressive sole width technology for improved control. Putter: Mallet with alignment to help give you incredible accuracy. Stand Bag: Lightweight, durable bag combines a cool authentic look, 5 convenient pockets, and an easy to carry back strap. The Strata Plus Women’s Set is a full set for women who want a great combination of distance and forgiveness right out of the box. 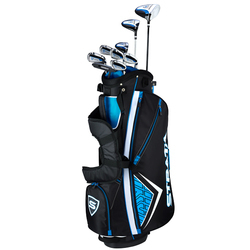 Set includes: Driver, 5 Wood, 5 Hybrid, 6 - 9 Iron, PW & SW, Putter, Stand Bag, and 3 Headcovers. 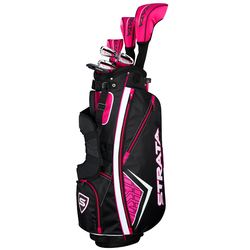 The Strata Plus Women’s Package Set is designed with distance and forgiveness technologies for women who want to easily hit accurate shots that go a long way. Now you have full course coverage from tee-to-green, giving you the confidence to hit good shots with every club in the bag. Driver: 460cc clubhead with a larger sweet spot and graphite shaft for more distance off the tee. (Headcover included) Fairway Wood: Stainless steel clubhead and graphite composite shaft promote faster swing speeds and long shots. (Headcover included) Hybrid: Designed for versatility and forgiveness on shots where you would usually hit a difficult long iron. (Headcover included) Irons: 6-SW Perimeter weighting and progressive sole width technology for improved control. Putter: Mallet with alignment to help give you incredible accuracy. Stand Bag: Lightweight, durable bag combines a cool authentic look, 5 convenient pockets, and an easy to carry back strap. Strata Ultimate Women's Set is designed for ultimate distance and ultimate performance for women with modernized golf technology to cover you from tee to green. 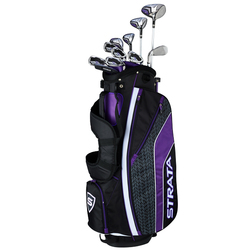 Set Includes: Driver, 3 Wood, 4 & 5 Hybrid, 6 - 9 Iron, PW & SW, Putter, Stand Bag, 4 Headcovers We packed the Strata Ultimate Women’s Set with modernized golf technology to give you ultimate distance, performance, and forgiveness for every club in the bag. Expect longer shots with ease, more control and more confidence, all at an incredible value. The full complement of clubs will have you covered from tee to green. Driver: Full titanium driver gives you a large sweet spot and more forgiveness to bomb it off the tee. (Headcover included) Fairway Wood: A very forgiving 3-wood built for long, high flying shots in a more aerodynamic head shape. (Headcover included) Hybrids: They’re great alternatives to long irons, so you can play with more confidence on a variety of shots. (Headcovers included) Irons/Wedges: High flight technology delivers distance, forgiveness, and control from stainless steel irons. Putter: Precise face milling is designed for better accuracy and distance control to help you sink more putts. Stand Bag: Lightweight, durable bag combines a cool authentic look, convenient pockets, tee holders and an easy to carry back strap. Strata Ultimate is designed for ultimate distance and ultimate performance with modernized golf technology to cover you from tee to green. Set Includes: Driver, 3 Wood, 4 & 5 Hybrid, 6 - 9 Iron, PW & SW, Putter, Stand Bag, 4 Headcovers. 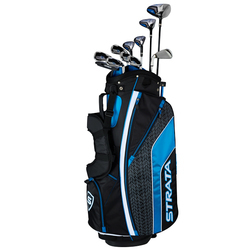 We packed the Strata Ultimate Set with modernized golf technology to give you ultimate distance, performance, and forgiveness for every club in the bag. Expect longer shots with ease, more control and more confidence, all at an incredible value. The full complement of clubs will have you covered from tee to green. Driver: Full titanium driver gives you a large sweet spot and more forgiveness to bomb it off the tee. (Headcover included) Fairway Wood: A very forgiving 3-wood built for long, high flying shots in a more aerodynamic head shape. (Headcover included) Hybrids: They’re great alternatives to long irons, so you can play with more confidence on a variety of shots. (Headcovers included) Irons/Wedges: High flight technology delivers distance, forgiveness, and control from stainless steel irons. Putter: Precise face milling is designed for better accuracy and distance control to help you sink more putts. Stand Bag: Lightweight, durable bag combines a cool authentic look, convenient pockets, tee holders and an easy to carry back strap. 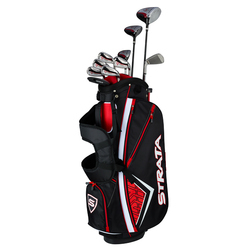 The Strata Tour Package Set is designed for increased performance on every shot. Set includes: Driver, 3 Wood, 4 & 5 Hybrid, 6 - 9 Iron, PW & SW, Putter, Stand Bag, and 4 Headcovers. The Strata Tour Package Set is engineered to give you high performance on every club for better shots from tee-to-green. The lightweight 460cc forged driver, fairway wood, hybrids, irons and putter make up a set that provides a great combination of distance, forgiveness and control. Driver: A lightweight 460cc forged driver that has a large sweet spot and a titanium head, it’s designed for distance and forgiveness that will help you hit it farther off the tee. (Headcover included) Fairway Wood: The fairway wood is very forgiving and have a more aerodynamic head shape for long, high flying shots. (Headcover included) Hybrids: A great alternative to difficult long irons that gives you more confidence on a variety of shots. (Headcovers Included) Irons: 6-SW These stainless steel irons offer excellent performance with a combination of forgiveness and control. Putter: A mallet putter with a visual alignment aid to help give you incredible accuracy. Stand Bag: A lightweight and durable stand bag that comes with convenient pockets, cooler pockets, a rain hood and a backpack strap system. The Strata Tour Women’s Set is designed for increased performance for women who want to hit better shots from tee-to-green. Set includes: Driver, 3 Wood, 4 & 5 Hybrid, 6 - 9 Iron, PW & SW, Putter, Stand Bag, and 4 Headcovers. The Strata Tour Women’s Package Set is engineered for women who want high performance on every club for better shots from tee-to-green. The lightweight 460cc forged driver, fairway wood, hybrids, irons and putter make up a set that provides a great combination of distance, forgiveness and control. Driver: A lightweight 460cc forged driver that has a large sweet spot and a titanium head, it’s designed for distance and forgiveness that will help you hit it farther off the tee. (Headcover included) Fairway Wood: The fairway wood is very forgiving and has a more aerodynamic head shape for long, high flying shots. (Headcover included) Hybrids: A great alternative to difficult long irons that gives you more confidence on a variety of shots. (Headcovers included) Irons: 6-SW These stainless steel irons offer excellent performance with a combination of forgiveness and control. Putter: A mallet putter with a visual alignment aid to help give you incredible accuracy. Stand Bag: A lightweight and durable stand bag that comes with convenient pockets, cooler pockets, a rain hood and a backpack strap system.